Wishing all of you a very belated Vishu and Chithirai Thirunal.I really don't know how time flies and try as I may,I'm struggling to devote some time to the blog.Vishu was great,with my parents around and together,we made a simple sadya.They left soon after that.Day after,I had a dinner party at home for hubby's Boss & Co and both of us wanted to make sure that we leave no stone unturned.Back breaking work,I should say;)!! We made the famous Varutharacha Sambhar for Vishu and all of us loved it.I usually make Sambhar using Eastern Sambhar Masala[the best I've used so far].I saw this recipe for Varutharacha Sambhar,where the spices are roasted along with coconut and then ground to a paste and added to the cooked dal-vegetables.No prizes for guessing,I got this recipe from my recently acquired prized possession-my collection of recipes from Vanitha magazine. Verdict-I might sound clichéd,but I don’t know how else to describe it.One of the best Sambhar I’ve ever prepared.The delicate taste of the roasted coconut + spices gives it the extra punch.Hubby gave his thumbs up and asked me why don’t I follow this recipe everytime I make Sambhar;-). Varutharacha Sambhar ~ Sambhar with roasted coconut and spices! Cook the dal till soft. Dry roast the ingredients given for the masala till golden brown and grind to a smooth paste. Soak the tamarind in hot water and extract as much as 2 cups of ‘puli vellam’-tamarind water from it. Cook the vegetables in this tamarind water till done. Add the ground masala and dal to the cooked vegetables and let it boil-till everything gets mixed. Prepare seasoning in a pan with coconut oil and splutter mustard seeds and add curry leaves. Add the seasoning to the sambhar and garnish with freshly chopped coriander leaves. *Small onions can be skipped.Though I got this recipe from a sadya special,I don’t think onions-garlic are added to dishes while making a sadya.It tastes great without the addition of onions too!! 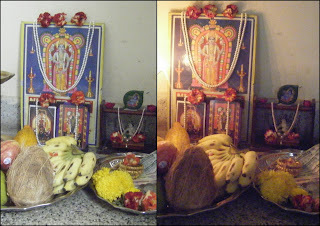 Here's my Vishukkani and the Vishu Sadya!! Wonderful looking Sambhar, masala with shallots sounds great. I will try. Weather is getting warmer here, so don't feel like cooking much except the daily stuff. Have a wonderful weekend. Wish you and your family a very Happy Vishu. Sambar looks and sounds delicious. I like sambar masala with coconut, as it makes it a little sweet. Have a great weekend. Yummy sambhar Divya..Using fresh spices would have given sambar a rice aroma and divine taste..
nice pic of sambar, it's difficult to get good clicks of gravies. sambar looks great Divya! What a delicious sadya you had! Hope you had a great vishu! Have a great weekend..shall b back here for posting feedback.My family sambhar fan! :)So gotto make this! Very tempting sambar. Lovely presentation. Traditional & nice click too. good pone..vishu sadya looks wonderful..I made a simple one for vishu.. Delicious sadhya...! Wishes for you.! Have posted new one at my world food blog. Do check out! Happy Vishu!! Nice pictures and sambhar looks Yum!! The sambar looks great. I never added both tamarind and tomato to sambar because I thought it would make the sambar sour. I will try this the next time I make sambar.